The Cleburne High School Ex-Students Association is seeking nominations for the Coming Home Queen, Parade Marshall and Wall of Fame awards to be presented in conjunction with 2018 Homecoming festivities. Recipients of the Coming Home Queen and Wall of Fame recognitions must be Cleburne High School graduates who exemplified Yellow Jacket Pride throughout their years at CHS and have continued to bring honor to their alma mater in their adult lives. The Wall of Fame Award can also be presented in memoriam. 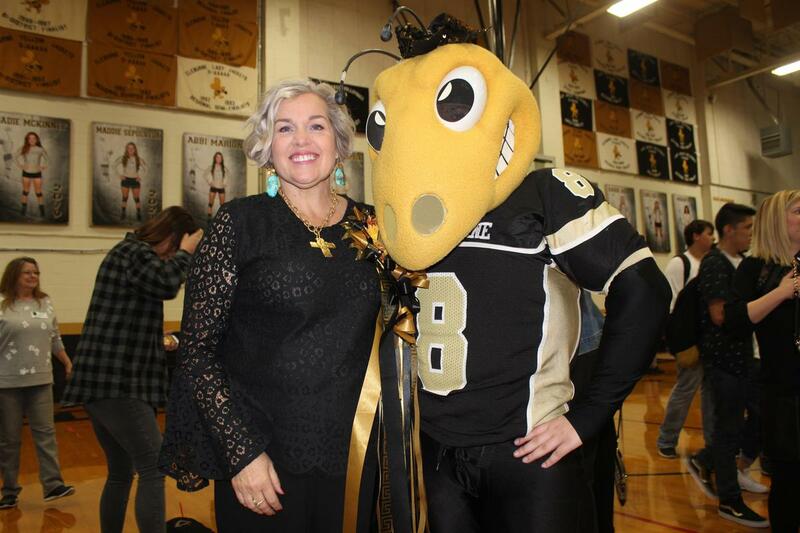 The Homecoming Parade Marshal honors a CHS graduate or an individual(s) who has served the students of CHS through their involvement and dedication as an advocate for the Jackets and the high school’s heritage of excellence. Award nominations should include information on the honoree, along with the contact information of the nominator. Award submissions may be emailed to shaylynnmc@yahoo.com or mailed or taken to the CISD Central Offices, 505 N. Ridgeway, Suite 100, Cleburne TX 76033. Nominations must be received by September 10. Cleburne High School Homecoming activities will kick off September 20 with the annual evening parade, to be followed by the community pep rally and traditional bonfire, conditions permitting. The Homecoming football game will take place 7:30 p.m. September 21 as the Jackets take on Waco-University in the District opener. 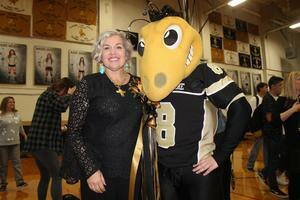 Cleburne High School Ex-Students Association Coming Home Queen Kayce Suitt poses with Super Jacket during last year’s Homecoming pep rally. The CHS Ex-Students Association is seeking nominations for 2018 alumni awards which include the Coming Home Queen, Parade Marshal and Wall of Fame recognitions.